Hey Everyone! Hope you are all well and are having a lovely Thursday. Just one more day till the weekend. You can do this. Note how I said you because sadly I work pretty much every weekend. It's okay though I love my job so it doesn't bother me and I'm still able to enjoy myself and relax during my days off during the week so it's not all that bad. Anyway, enough rambling. I thought I'd do another share the love post today. The other day I shared my love for the blogging community (click HERE to read that post) so today I thought I'd share with you some of my favorite bloggers and vloggers at the moment. These ladies I just find so super inspiring and think they are such amazing kind, wonderful people as well. A lot of these ladies you might already follow but if not you definitely need to be. Enjoy this post. I've been following Emma Miller on social media platforms since she appeared on Made In Chelsea a few years ago. Since then she's developed a youtube channel and a blog and is just an absolute babe! She's so lovely, her figure is to die for, and she's just an all round nice person in general. I absolutely love her content and would highly recommend following her. Her snapchat always makes me super jealous as she's always going on runs in the most stunning of places in London, attending a fab event or is somewhere fab abroad. I get serious wonderlust when I see the beautiful places she's been to. But yeah, like I said, definitely someone worth following. The gorgeous Ellie is a blogger I have been following for some time now but and as bad as this sounds I didn't really check out her blog properly until towards the end of the year in around October time and I can't believe what I've been missing. She has got the most quirky and fun writing style and the most amazing fashion sense. Literally all her outfits on her blog are just amazing. I also love her youtube channel as she's just a fun, genuine and absolutely lovely person. I've followed the gorgeous Olivia for years now and she's just an absolute utter babe. Not only is she so incredibly pretty but she has the most amazing fashion sense, her photography is just amazing, she is also a complete and total bookworm like myself so I always love turning to her blog or youtube for new things to read. She's also a lovely person. Megan is like a real life fairy princess. She always wears the prettiest of outfits and I'd happily adopt her entire wardrobe. I feel like Megan's blog definitely took off a lot more in 2016 and I absolutely adored reading all her posts. Her blog has got so much variety on it and she talks about topics that not only she loves but that are important to her and I absolutely love reading it. She's also a complete babe and one of the loveliest girls I've ever spoken too. Kayleighi is probably one of the first friends I made via blogging and I absolutely adore her. She is just the sweetest person ever and her blog is another one that I feel really took off in 2016 and it is absolutely deserved. She's so lovely and her content is fabulous. She's also one of the most supportive people on the internet and is just fab. Definitely a blogger to follow if you're not already. I couldn't write this post without including the lovely Em from Emtalks. She's just so lovely, creates the best content and again is one of the nicest and most supportive bloggers I've ever had the pleasure of speaking too. Em has recently started to get a lot more into youtube as well and her content on there is also amazing. I feel like 2017 is the year her youtube really takes off as much as her blog already has. If you're looking for inspiration for fitness, travel or anything else in life then Em's blog is the best place to go as it has everything on there. Lucy and Lydia are the twin sisters I discovered back in 2015 and since then I've been following their content a lot on youtube and I just absolutely adore them. They are two of the happiest people I've ever come across and it's lovely to see two such positive people on the internet. I'd definitely recommend following them. I think it's important to have people you can turn to to cheer you up and instantly make you laugh and these two just tick that box for me. Suzie is one of the loveliest youtubers out there. Her content and blog are always amazing and I just find her style of videos and blog really interesting. She just has a really relaxed tone to her voice and writing style. She also gives me serious face envy as her skin always looks perfect and her make up is just always stunning. Definitely a girl you should be following. This girl is literally on fire and I don't mean her hair either. She's such a nice and funny person, her blog is amazing and she's just super lovely. Her blog has so much great content on it and I love the fact she's a complete and utter bookworm too so I'm always getting some amazing recommendations from her. I'd definitely recommend following her if you're a bookworm. So I hope you enjoyed reading this post and finding out more about my favorite bloggers and vloggers at the moment. I decided to write this post because I just feel like 2017 needs to be the year we celebrate, encourage and empower other people for their achievements. All of these ladies have accomplished so much and that deserves to be recognized. Let me know if you follow these ladies and what you love about their blogs. It was very hard to narrow this down to just 9 people so consider this a part one. There will definitely a part 2 up in the near future as there's just so many other amazing inspiring bloggers and vloggers out there. 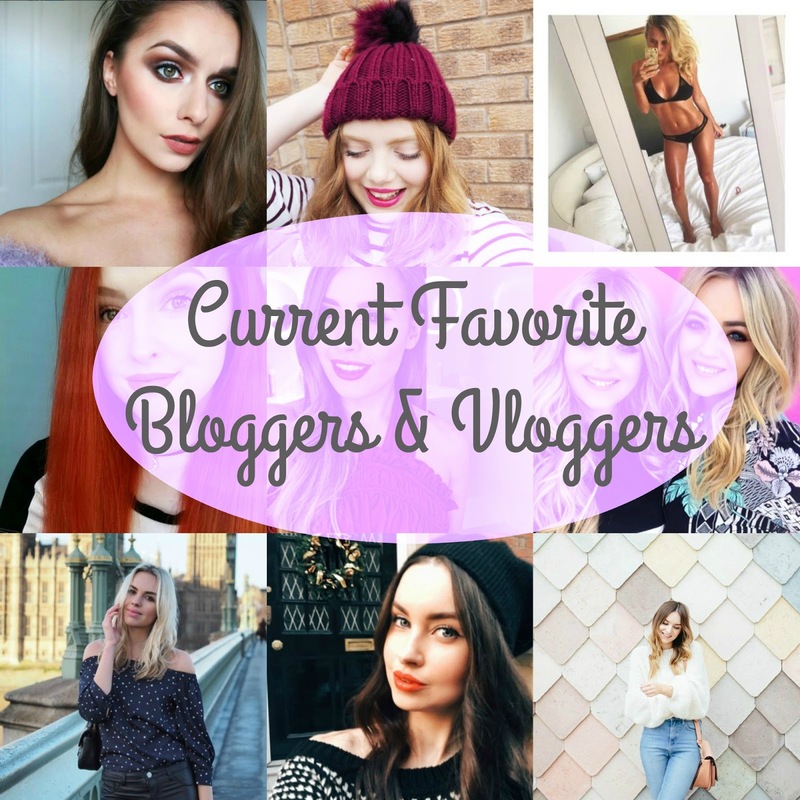 Who are some of your favorite bloggers and vloggers at the moment?